If you play golf, whether it is a scratch or beginner player and don’t use a rangefinder device, then you are putting yourself at a disadvantage. A rangefinder might just provide the easiest way to shave a couple of shots off and is indeed a good way of reducing frustration and having more fun on the course. So just, imagine what the lightest model of the Nikon golf line Nikon COOLSHOT 20 Golf Rangefinder can do. In golf, distance is an essential element that you always have to take into consideration for success. Although experienced and professional golfers can estimate it using markers and physical things like trees and bushes, it is not always perfect. A golf rangefinder device is what you need for reliable and more accurate data. The best golf rangefinder is very simple to use as a point-and-shoot camera. 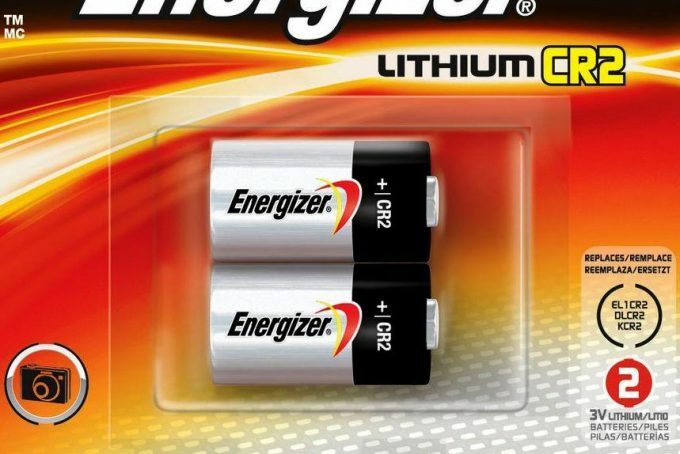 It can work well on any golf course regardless of the weather conditions, with batteries lasting for many rounds. In this comprehensive guide, we’ll provide a detailed overview of the Nikon Coolshot 20 Golf Rangefinder. 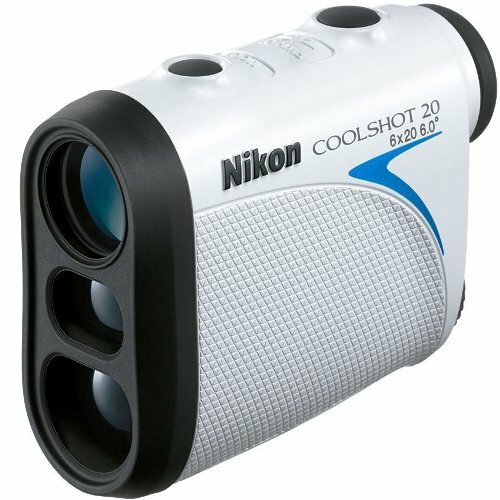 When you think about Nikon, think about Nikon CoolShot 20 Golf Rangefinder. 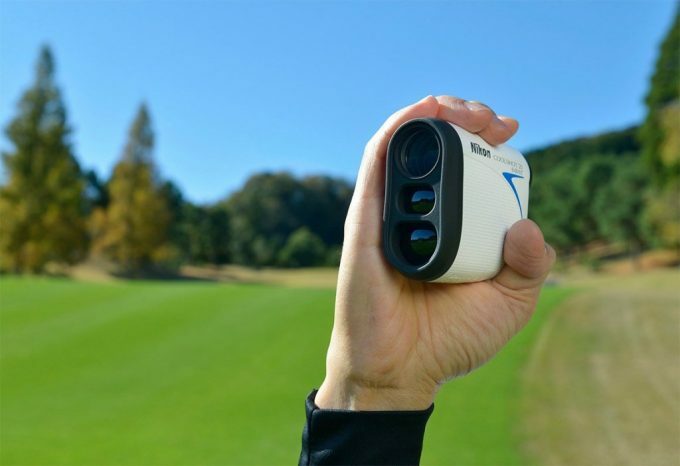 This golf rangefinder has earned its place in the sport by phasing out the need to depend on yardage markers and eliminating the caddie with the yardage book and other landmarks. This excellent device uses different technologies to impact the player with precision when playing and lessens the number of shots on a ball. The COOLSHOT 20 golf rangefinder gives the exact distance to the selected targets anywhere on the fairway with just a single push of the button. This rangefinder is a reliable device that offers precise measurements and shot-to-shot support on the course. The COOLSHOT 20 comes in a sleek white color with black and blue accents and a battery for operation right away. The Nikon rangefinder also comes with a sturdy nylon case that will protect the device and has an adjustable loop on the back, which allow you to attach the rangefinder to your bag or belt. This little tool is packed with a powerful punch and easy-to-use handheld tool to provide you quick and accurate measurements. It comes with a 2-year warranty that will assure you manufacturer repair or replace in case there are malfunctions and defects in the device. No matter how several features this product has, it is not a good product if it is not durable. The design of the COOLSHOT 20 is also optimized to be both compact and ergonomic. It is also durable, so you have nothing to worry about and the glossy surface help in keeping dust particles at bay. It’s built with a rubber armored metal housing which means this feature ensures that your rangefinder won’t get damaged if falls during your game.As well as protected with a waterproof body made to resist rain and splashes of water, so this unique feature gives you peace of mind knowing that water won’t stop your device from providing a reliable distance reading. This COOLSHOT 20 ensures display of accurate and useful information on any day, be it sunny or rainy weather. The rangefinder has wide temperature tolerance, which will not require you to stop using the device when the temperature becomes unstable. The COOLSHOT 20 is one of the smallest rangefinders on the market with an item weight of 4.5 ounces and dimension of 3.6 x 1.5 x 2.9 inches. This gives the golf rangefinder an upper hand over most other rangefinders on the market since it is compact and small enough to be easily slipped into a trouser or jacket pocket in between shots. The compact size allows you to operate it with one hand, making it a perfect option for people who do not want to carry a large rangefinder with them all day long. The small size also allows you to focus only on your target and eliminates any disturbances present in the course. It is extremely easy to use, and all you need to do is just to point the device at your target and push the rear button, which turns the device on. You can from there, get the target in the crosshairs. 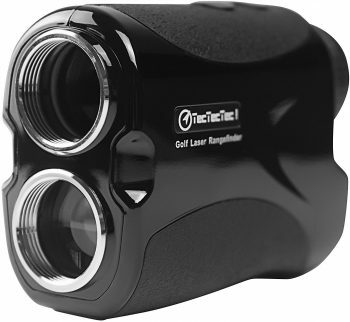 The ease of access and secure storage helps this golf rangefinder ability to be used quickly. You get a more unobstructed view of the terrain and surroundings with this high-quality rangefinder. The COOLSHOT 20 uses one CR-2 lithium battery. With this, you can use the device longer. It could save you for more extended periods of time at the golf course, but you need to charge the device fully to enjoy its lasting battery life feature. To save energy, the Nikon also has an automatic off feature that will turn the device off after about 8 seconds of idleness. This type of rangefinder is power-efficient and economical as well. With this rangefinder, you won’t have a dead rangefinder halfway through your course. In addition, the device displays the battery’s status, so you will not have to bother about checking it every minute. The accuracy level of this rangefinder is one major booster of this device. 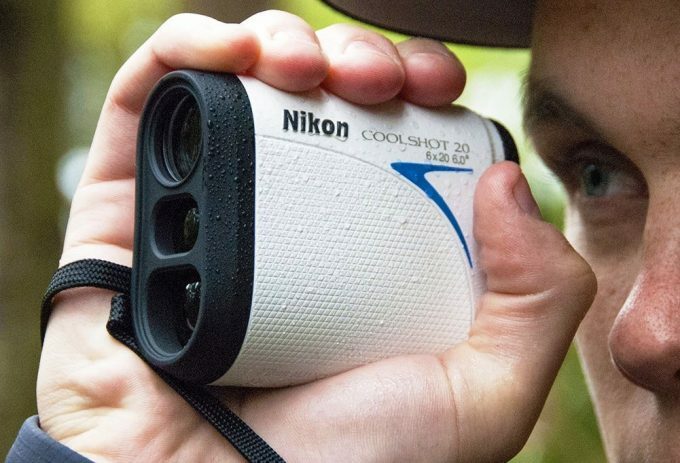 The Nikon COOLSHOT 20 rangefinder delivers impressive accuracy with a measurement range of 6 to 650 yards in 1-yard increments despite the small size. The 8-second continuous measurement allows you to cover multiple targets, all done with a push and release of the Power button. 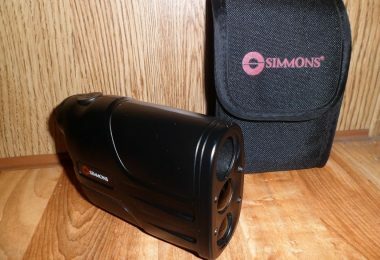 If you want, a tool to improve your game the most, then this rangefinder is a great place to start. You will never need to guess the distance on the golf course, and you will quickly picture anything. Other notable features of the rangefinder is included HD clarity and optics as well as continuous scanning mode. This rangefinder also utilizes a First Target Priority system, which allows the device to focus on the target in the background and provide precise distance reading despite other objects around the target, which is an excellent feature when you want to detect a flagstick. The 6x magnifications help you focus your attention on a target up to 650 yards with the primary 6-power monocular lens that features LED illumination and Nikon optics for more comfortable viewing in dark conditions. It instantly responds to everything on the golf course and brightly displays results through its high-quality LCD. The 16.7 mm viewfinder is designed for long eye relief and affords eyeglass wearers leisurely viewing. With perfect contrast and increased light transmission, you’re also guaranteed to get bright, crystal clear images, and you will never miss out on valuable information and readings even in less-than-perfect conditions. When shopping for anything, it is always vital to consider your budget, you should invest in a high-quality brand, as it will serve you for many years and so the CoolShot 20 Golf Rangefinder is not an exception. This device excelled and provided services to every class of people on all budgets. The Nikon engineers have designed the COOLSHOT 20 as a reliable and compact device that will offer shots convenience on every approach in the game, at an affordable price, which makes it an attractive purchase. There is nothing better than this Nikon rangefinder if you are looking for the best value for your money. You will be able to see what lies behind, ahead, above or below, thanks to its fantastic sharpness and clarity. Golf is a sport that requires planning, precision skill, and discipline. Now that we are done with our main product, we look at some other rangefinders, which we term close competitor. 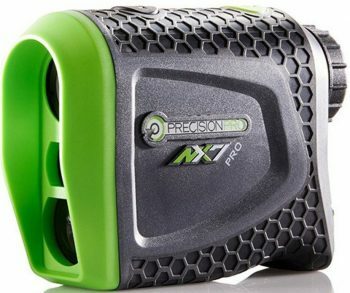 The Precision Pro Golf NX7 Pro Rangefinder comes with an Adaptive Slope Technology that enables you to toggle between tournaments legal Non-Slope Mode and elevation measuring Slope Mode. The high-speed Target Acquisition Technology (TAG) Laser quickly provides distances to the flag, trees, or hazards, etc. The operation is simple as it has only 2 buttons, one for power and the second to switch the device modes. The power button also acts as the activation button to get the yardage. This rangefinder emits a laser beam to calculate the distance between you and the target. The beam reflects back the aim to the golf rangefinder, providing you with relevant insight before you take your first shot. The Precision NX7 Pro is small and weighs only 9.6 ounces with product dimension of 6 x 8 x 4 inches. The NX7 Pro is accurate within 1-yard, and the laser technology measures range to the 1/10th of a yard. The precision NX7 Pro Rangefinder is built with durability in mind, and you can feel the quality in its outer casing. The rugged design is suited to the rigors of golf course life because the shockproof design helps with falls, tosses, or any other impacts you encounter on the golf course. The NX7 Pro is made to survive the elements, seeing as the water-resistant design gives you the freedom to use the product in any conditions. 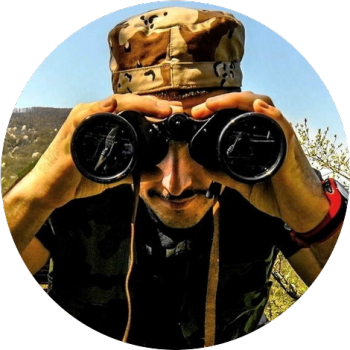 The rangefinder is of high quality and has a 6x magnification, meaning it can quickly lock on flags that are as far as 400 yards. The ergonomic no-slip grip and compact design reduce vibrations for a steady viewing experience and increase steadiness in your hand. With the Precision NX7 Pro, there is no need to guess the distance on a par 3, no need to look for sprinkler heads, and no need to guess how far it is to carry the bunker. The extended 2-year warranty indicates your product is covered and the Precision Pro’s free battery replacement service ensures you’ll never run out of power. Package includes NX7 Pro Rangefinder, a 3-Volt battery, instruction manual, premium-carrying case, cleaning cloth, and lanyard. Precision Pro is both the Laser and GPS Rangefinder segment which is a good thing as more options, particularly more affordable ones for the golf consumers out there. The TecTecTec VPRO500 Golf Rangefinder is made of solid and upscale materials while it has a smooth and soft superficial coating. This rangefinder is very compact and lightweight, thanks to its 1.6 x 2.8 x 4.1 inches dimensions while its weight is just 6.6 ounces. The diopter adjustment functionality will always assure you a clear and bright view whether you’re farsighted or nearsighted. This VPRO500 golf rangefinder is worth buying as it bundles essential features such as user-friendly operation, high power magnification, sturdiness, and lightness while it is equally made of durable materials. 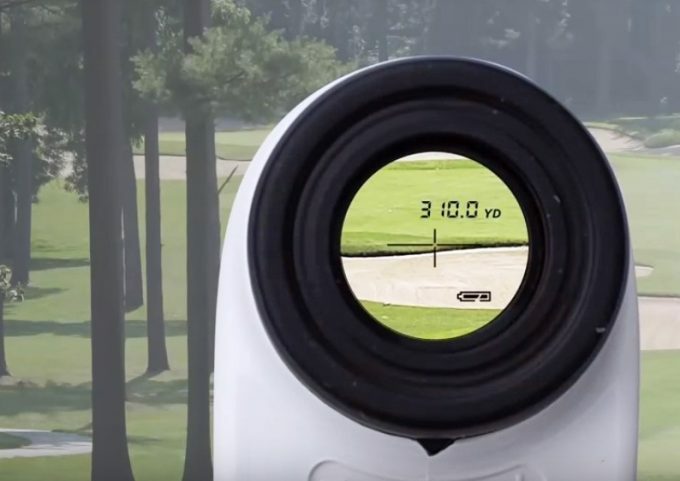 The VPRO500 rangefinder can measure and up to 540 yards within +/- 1 yard with continuous scan mode to help you find the right distance to golf flags, hazards or trees. Not the highest coverage in the world, but this coverage is more than good enough for most golfers on the course. The Pinsensor Technology not only allows you to get fast readings but also offers super accurate readings up to +/- 1 meter and over five thousand actuations, while the technology enhances the rangefinder’s capability to dodge obstacles too. The gadget is equipped with extra focus dial for clarity and high resolution. Other highlights include advanced technology optical properties for image clarity and sharpness in all conditions. 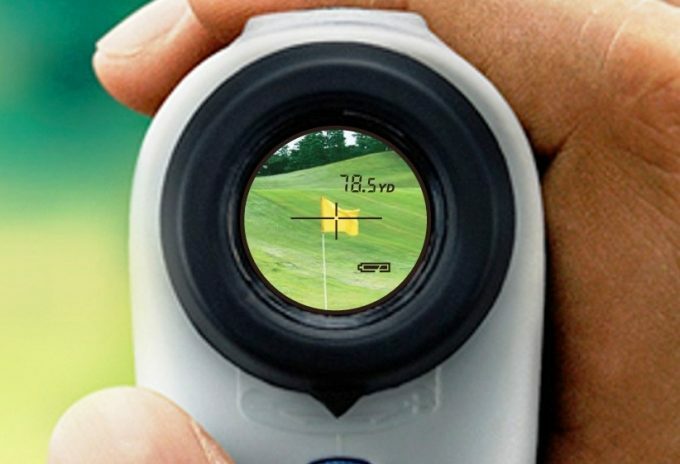 This golf rangefinder has three modes to choose from, and you can activate the three modes to locate the flag. The first mode is called the First Target Priority, and it aims to find the flag right away even if there are backdrops. The second mode is known as the Distance Target Priority, which measures the distance of the unfavored backdrops. The third mode is the ProScan, which aims to calculate the distance of the flag. This VPRO500 rangefinder has a sturdy case, and if there are accidental falls or the like, it is still well protected. The pack of this rangefinder is sealed so that moisture will not go into making this product water-resistant. The TecTecTec VPRO500 is overall very durable, may last you for years, and comes with a 2-year warranty. The VPRO500 golf rangefinder comes fully equipped with a premium case, wrist strap, free CR2 battery, quick start guide for easy setup and a microfiber cleaning cloth. If you are a professional or amateur golfer who values accuracy of the readings, compact and lightweight products, user-friendliness, and of course a low retail price, then the TecTecTec VPRO500 Golf Rangefinder is probably for you. There are a few accusations and complaints against the TecTecTec VPRO500 feature, though as it seems that the reading couldn’t get past a small tree. 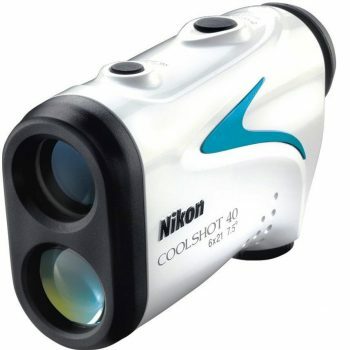 The Nikon COOLSHOT 40 Golf Laser Rangefinder is a mid-level laser rangefinder in the Nikon COOLSHOT brand’s lineup. It can give you a fast and perfect measurement, and it is very lightweight to carry. Despite its small appearance, a golfer will also benefit from a precise distance measuring that is only matched by a few other rangefinders. 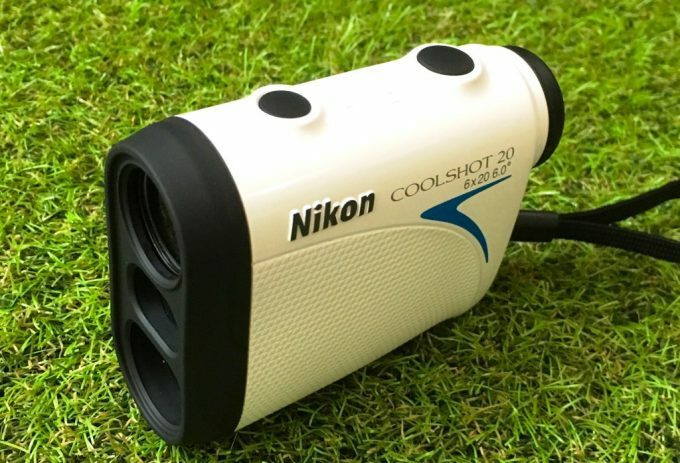 The Nikon COOLSHOT 40 Golf Rangefinder has better accuracy with a range capability of 8 – 650 yards. The best part of this rangefinder is that the device is quick. You can use it in the greens without any hesitation. It also features a 6x magnification power, and it’s the most potent USGA approved rangefinder from Nikon`s range. The Hyper Read Technology ensures that you will get your measurement very quickly on various points of approach and is useful during training or tournaments. Coming with 4.4 x 1.4 x 2.8 inches and 5.6 ounces weight, this golf rangefinder is one of the best options for golfers or traveling players looking for a simple solution for measuring distances. This rangefinder is easy to use: just press down the POWER button, and it will measure the distance continuously for 8 seconds and will help you to measure the distance to the trees, hazards or obstacles on the green. The accuracy is perfect up to +/- 2.25 feet and has the distances detailed on the screen with the hyper read feature. The COOLSHOT 40 weatherproof features ease any anxious thoughts about getting the device wet in poor weather. This golf rangefinder will not trouble you at all, even if it is raining all day. The engineers designed this model with easy viewing for those who wear glasses in mind, so the design of the product is modern and follows the lines of Nikon`s rangefinders. The COOLSHOT 40 uses a rechargeable CR2 lithium battery, which means you do not need to bother about buying a battery every day. All you have to do is to just recharge the battery before going out to the green. This is a good rangefinder for those searching for all the features of a high-grade rangefinder. It’s compact, up-to-date, looks smart, and well built. 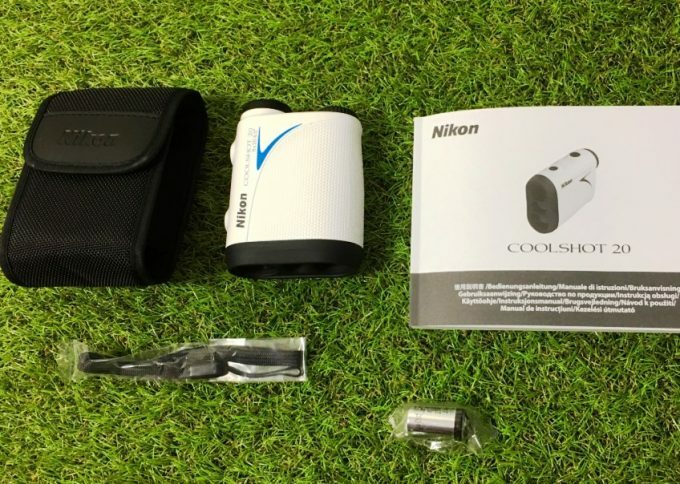 Nikon is a leading brand when it comes to rangefinder technology, and the COOLSHOT 20 golf rangefinder is another top class product produced by this top brand. The company utilizes their many years of experience in the manufacture of this reliable rangefinder. It offers state of the art technology with usability, durability, and better aesthetics than their main competitors and this the reason why COOLSHOT 20 golf rangefinder manages to top our overall and value rangefinder categories. Some of its main features include 8-second scanning, First Target Priority Tech, 6x magnification and it has a range of up to 550 yards. It is always our goal to help golfers find the best rangefinders for their golfing needs, and that’s the reason why we put this guide together to help players find a golf rangefinder, that suits their particular game level and budget. 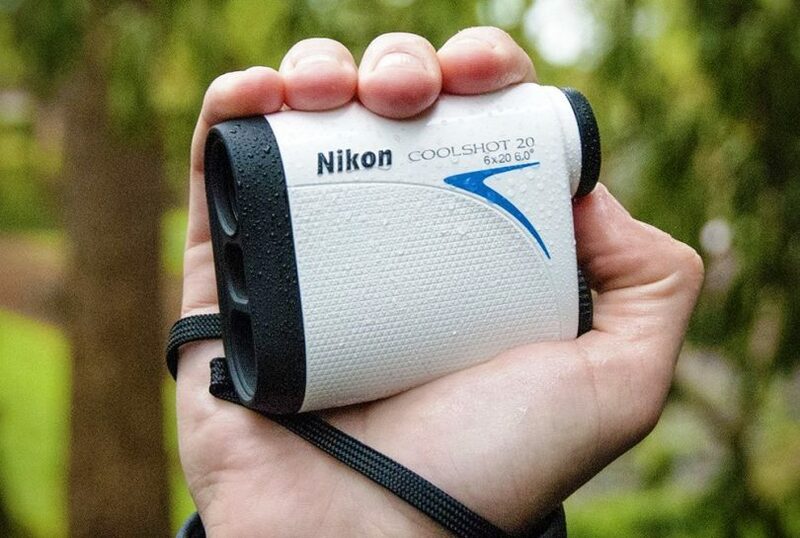 Overall, the Nikon COOLSHOT 20 golf rangefinder has an excellent value for money. 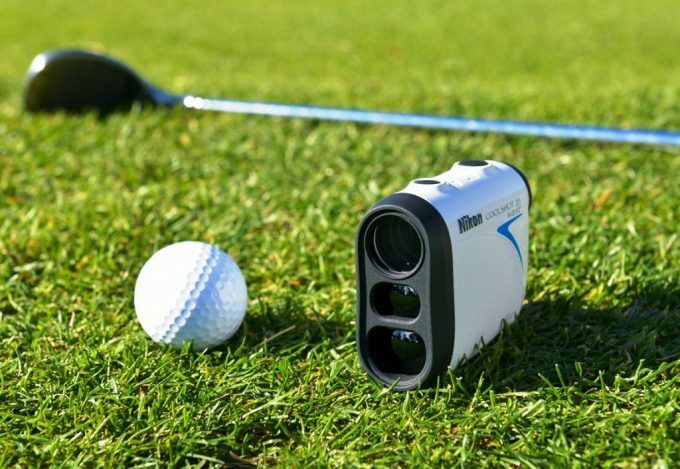 We recommend this device to any golfers looking for a compact, small and highly efficient rangefinder. 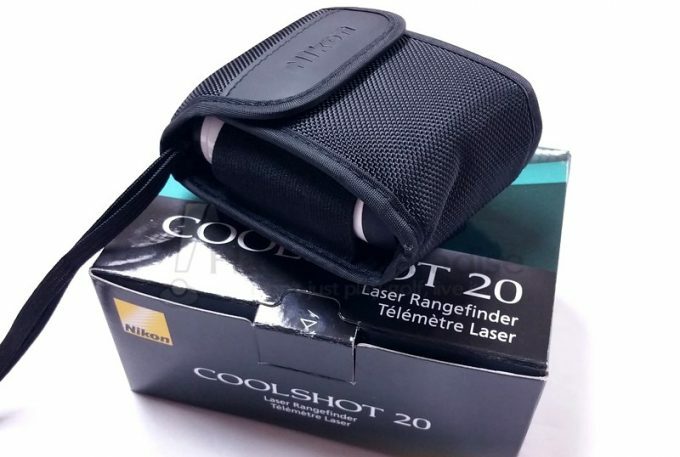 If you have previously used the COOLSHOT brand, then the COOLSHOT 20 is a perfect upgrade. It will be an excellent choice. As the lightest model from the COOLSHOT line, Nikon COOLSHOT 20 golf rangefinder doesn’t disappoint. Although it has some disadvantages we’d like to see fixed, it provides world-class optical performance and excellent value for the price. We hope that this review of the Nikon COOLSHOT 20 has provided you with the information you needed. What is your experience with golf rangefinders? Have you tried one of the products we talk about here? If yes, which one? We’ll like to know in the comment section below.